I just installed a catgory II Pat's Quick Hitch today and experimented with attaching and detaching various pieces of equipment including a bushhog, spring loaded tiller, box blade and rototiller. As a result, I have a couple of observations that my research here and elsewhere did not reveal and should be of interest to anyone considering buying one of these or other similar quick hitches. Like many of you I have equipment such as a bushhog, boxscrape and so on, that can be used on both a category I or II hitch. My tractor is a Mahindra 4500 and though it has a category II hitch, it has only 42 or 45 hp depending on who you listen to. With the hp, category I equipment is fine. However, herein lies the problem. This is because the only category I implement that I could get the hitch to attach to the two side links without getting off my tractor was the bush hog. Those familiar with these kinds of hitches know that this is a big selling feature. The reason was because of bracing or some other aspect of the design of my category I equipment would not allow the hitch to go under and then up on the equipments' mounting pins. With the exception my bushhog, I had to unhitch my sidelinks and bring the quick hitch in from the side of the implements mounting pins. On my spring loaded tiller, I could not get the Pat's Easy Hitch on at all. However, I think with some minor grinding around the hitch pins on this piece of equipment, I will be able to mount it. With all this said, if you have a category II hitch and all you have is equipment made especially for that hitch then, you might be able to attach the two side links without getting off of your tractor. I know this is case at least for my category II scrape blade. Also, I can't say for sure, the smaller category I version of Pat's Quick Hitch may be more likely to attach the side links to more pieces of category I equipment without getting off the tractor though, I am sure not all. My second observation is that you must remember that the hitch adds about 3 to 4 inches of length to your side links. This could be a problem with shortened PTO shafts. Since I bought my Kingcutter II rototiller used, the PTO shaft had been already shortened some to fit the previous user's tractor. Though it still fit my tractor fine it was shorter than it could have been with my larger tractor. With the added length incurred with the installation of Pat's Quick Hitch , the pto shaft still reaches but, it is getting a little close to not having enough overlap between the two pto shaft sections to provide the needed strength for hard soil conditions. That is not to say I don't like Pat's Quick Hitch. Though I still had to go in from the side with the side links on my tractor on most of my implements, they were MUCH easier to get on than on the old three point hitch arrangement. Also, the Pat's Easy Hitch was MUCH easier to get off. No more taking the heal of your shoe to try and knock off the side links. Overall, Pat’s Quick Hitch was a good investment in time savings and safety and I would highly recommend getting it or similarly made hitch. I have had a Cat 2 PEC on my 45hp tractor for several years now. All my implements originally came with Cat 1 lift pins. I swapped most of them out for Cat 2, to minimize the number of potentially lost/rusted adapter bushings. Nevertheless, my Cat 2 PEC will pick up every implement I own - regardless of which lift pin is installed. On one (the boxblade I think) I reversed the lift pins for easier pickup. So even though I sympathize, you may not yet have explored your full range of options. The PTO shaft length issue can easily be remedied with a PTO adapter from AgriSupply. They cost under $20 bucks, and effectively add about 4" to your tractor's PTO spline. You didn't address the toplink. Your PEC will likely require you make adjustments to - or buy longer - toplinks. In my case, installing PEC actually remedied the minor issue of a HTL that was slightly too long for a few implements. I purchased at set a while back off the internet, they do add a little to the lenght of the lift arms and top link. But all my attachments work with them, the heel of my boot is taking less punishment now. I would buy another set if I had 2 tractors. I'm just curious how a Pat's Quick Hitch differes from a conventional quick couper. I have a Land Pride quick coupler on the 4310. I like it better than the Deere quick coupler because the top hook is adjustable up or down, the top hook on a Deere quick coupler is in a fixed position. Mine is a Cat 1 to fit my little Cat.1 sized machines, Everything hooked up without adjusting the top hook except an older blade I used to have but since I sold that I don't have to adjust the top hook for anything now. 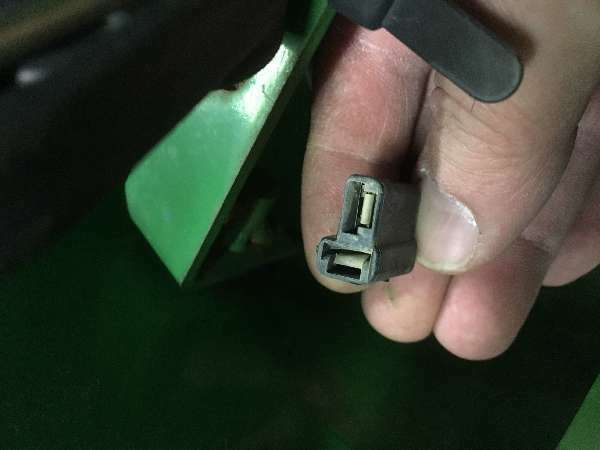 Deere makes a quick coupler that will connect the PTO on a rear mounted PTO driven machine like a tiller or a rear mount mower without you getting off the seat. I've only saw pictures of them so I don't know how well they would work. I gave my brother a set as a gift and he had to change some pins as Greg has pointed out on some equipment. One thing I did not see mentioned is you move the lift point back 2 to 4 inches which can show up with heavy equipment. That was the negative on his tractor with a side mount rotatory cutter. At same time the length can give you more lift height due to the longer lift arms. Hardwood, tell us about the new hitch system JD is advertising this year. No it would not make me go green.. I'm not sure it is still available, maybe it didn't sell or didn't work correctly. I've never saw one on a dealer lot. It's been a couple years ago that I last remember seeing it in their literature. Basicly it was a quick coupler that had a bearing holder mounted below the top hook about where a PTO shaft would line up for a three point hitch machine to be at working heigth. From this bearing there was a telescoping PTO shaft that went forward to the PTO shaft on the tractor. All of this stayed in place whether a machine was hooked to the tractor or not. Your PTO operated machines had to be adapted with a bearing holder that lined up with the bearing holder on the tractor half of the hookup. A shaft that again stayed in place on the machine from the gearbox or whatever on the machine to the bearing holder just below the upper mast of the three point assembly of the machine. All of this lined up with the shaft that came thru the bearing on the quick coupler. If I remember correctly there was a hand lever reachable from the seat that stood up above all this that somehow using this lever hooked the two halves together. That's as best I remember it from the pictures. Any of you old timer International Harvester guys here that may have owned or been around a # 234 tractor mouinted two row ear corn picker from back in the 1960's will rmemeber their automatic PTO hookup, I had one it worked great. It was basicly pretty simple but maybe a bit hard to describe here tho. It was truly automatic, there were no hand levers to operate. I think the two halves of the Deere system that actualy connect may be similar to the IHC system from the corn picker only they are hand operated instead of spring operated. That's tonight's lesson, there will be a test tomorrow, OK.
For the price & warranty I don't think you can beat the Pat's Quick hitch system. I emailed trickmytractor before I ordered just to make sure I got the correct one's. I went with the set that went from a cat 1 to a cat 2. Now I can hook to both sizes. I just joined the Pats Quick Hitch bandwagon. Works nicely on my debris blower and rake. I am waiting to see how it works on my 925lb 3pt snowblower. Will update this post when I try it out.